Angel Faces • The annual retreat near L.A. is emotionally excruciating but also empowering. Corona, Calif. • The room rings out with the cruel nicknames that have haunted the teenagers for years: Crusty crab. Burnt toast. Snake skin. Freddy Krueger's daughter. Mutant. Scarface. 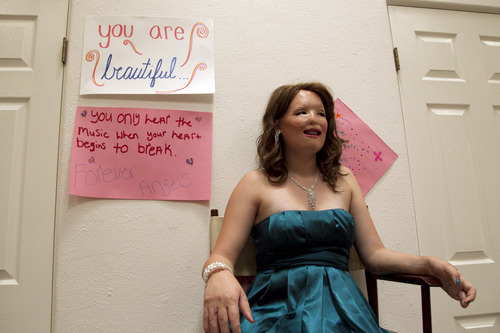 The exercise is emotionally excruciating but also empowering for these girls, who come from all over the world to attend Angel Faces, an annual retreat east of Los Angeles. Some were injured as infants; others arrive just months after a devastating accident. Several girls lost a parent or a sibling in the disaster that maimed them. The program uses group counseling, role playing and art therapy to heal emotional scars and teach strategies to cope with never-ending teasing, staring and probing questions. 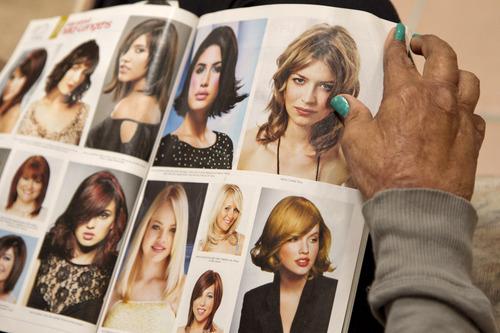 The retreat's softer side boosts body image with massages, facials, hair styling and makeovers by a professional cosmetologist who teaches the girls how to use specialty make-up to minimize their scars. The wisp of a girl hides behind the tresses of the long, brown wig that substitutes for hair and shuns make-up that could redraw her missing eyebrows. A web of thick scar tissue crisscrosses her upper face. 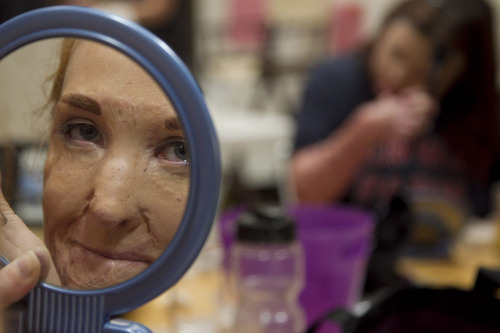 She has had more than 60 reconstructive surgeries, including one that used one of her ribs to replace bone in her forehead. "I only have one picture that was when I was first born when I had no burns. I do look at it sometimes and think about what I could have been like but I don't like to think about that, because I can't do anything about it and I can't change it," said Brady, who was removed from her biological mother and adopted at age 3. "After being here, I realized that only a few people are picked for this journey  and I was one of them," she said. Founder Lesia Cartelli conceived of Angel Faces after running a more traditional "burn camp" in San Diego for years. The camp focused on fun without getting at the trauma beneath the scars. Cartelli also grew frustrated with the self-pity that made campers see themselves only as burn victims and nothing more. "One day I saw three teenage girls walk by and I thought, 'I'm failing,'" Cartelli recalled. "They were going to go home the next day and come Monday, those three teenage girls were going back to school, back to rejection, back to staring, back to the unwanted questions. They need to know, 'How do I respond to somebody who's staring at me? How am I going to get my self-esteem back or get it, period?'" 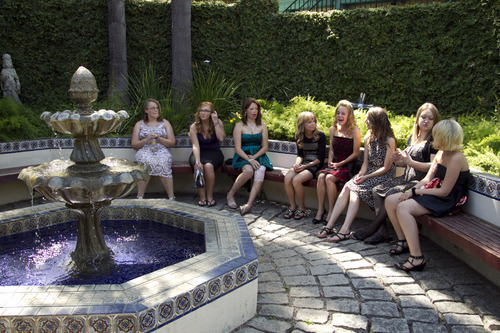 Cartelli offers the week-long program to fewer than two dozen girls once a year. They must complete a 14-page application and fundraising and donations cover the $3,500 it costs to bring each of them to the spa retreat in Corona, about an hour from Los Angeles. Participants can attend for up to three years and many return as volunteers into their 20s. "We spend the first couple of days really digging into the trauma. How did it happen? Where did it happen? What went on? Who was there? Who do you need to forgive? Is it yourself?" Cartelli said. "No one's asked these questions in a loving environment. It's tough. It's tough on us to watch it and it's tough on the girls." The 16-year-old from Bristol, Tenn., wears a long-sleeved jacket even when it's warm to hide scars on her arms. Cartelli urged her to provide details about her accident to make her seem less like a victim and turn the stranger's teasing into sympathy. "Do you see how when you change the language, you have compassion for that little girl? That girl who was you, who was burned in a house fire?" Cartelli asked, after she was done, pointing a finger at the teen's heart. Suddenly, Carrier put her face in her hands and began to sob on Cartelli's shoulder. 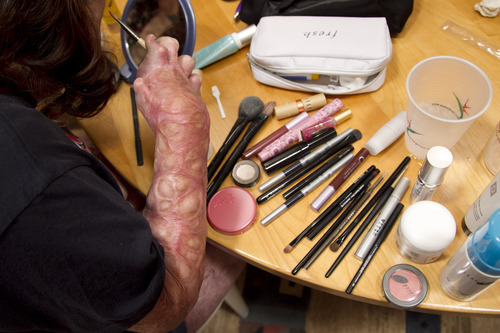 Carrier's worst scarring was on her arms, but a handful of the teens are so badly burned that wigs cover their scalps and thick, twisting marks are reminders of flames that chewed into their faces, legs and arms  in a few cases even burning away fingers. The 20-year-old art student from San Dimas, Calif., was burned over 40 percent of her body on Halloween when the zombie costume she was making for a trick-or-treat trip to Hollywood caught fire. Flames jumped from a sweater she was singeing to the red paint on her costume, scorching away a moon-and-stars tattoo behind her ear. Before the retreat, Riopka tried to deal with her emotions through art. At one point, she threw red paint on the ground and stomped on it in anger and frustration. Angel Faces showed her she is not alone and taught her how to cope with stares and questions. She said she now sees her art as a metaphor for her life and believes she was burned for a reason. The flames scorched her back but didn't touch her favorite tattoo  a Hebrew script reading "I can do anything with God" inked along her spine. "Sometimes the mistake in your painting is the most interesting part of the painting and I kind of look at life like that," Riopka said. "I actually realized that if I could go back to Halloween, I wouldn't change anything. You realize how strong you really are and we all know we have a purpose now  all of us."